— That Cost How Much? As much as I'm loving stocking up my winter wardrobe during this unusually good clearance season, I can't help looking ahead to spring and summer. The boho girl in me is missing my paisley prints, airy blouses, and caftans. Though it's still early for all that, there's probably nothing more transitional than a big beautiful scarf that you can wear at the office now and as a sarong on the beach in a few months. Celebrity favorite Theodora & Callum has been delivering jet-set ready, 70's inspired scarves and ready-to-wear since the early 2000's. Inspired by their travels in Africa, Morocco, and beyond, their pieces are guaranteed to give you a Diane von Furstenburg moment. 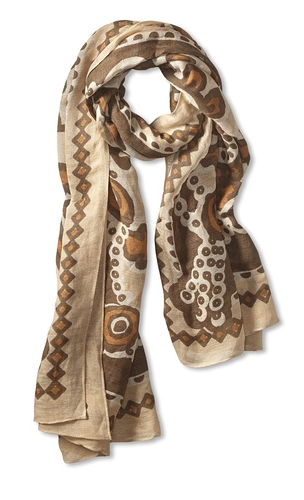 Normally, a scarf will run $175 and up. But fortunately for us, MyHabit has an assortment of their accessories and clothing starting at 70% off.